The Amrotec X-Count+ is an advanced, up-to-date and rebust Currency Counter with certain value counting functions. 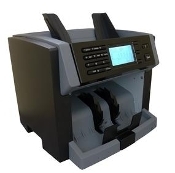 It is equipped with the most comprehensive, user-friendly functions necessary for tellers and retail cashiers in low to medium cash handling environment. XCount+ is designed to replace high-end expensive brand name Piece counters in market place today. XCount+ can be customized to be included with all counting modes available or only those are needed for customers for simplicity. Such customization can be done by your sales representative or by a trained personal at customer's location. XCount+ is constructed with compact and easy bill path access for jam removal and daily maintenance. XCount+ includes a unique hand-held design with flexibility of movement from one location to another location. XCount+ can be connected via USB port to AMROTEC's most innovative PC Suite software for software upgrade when it is needed. Software upgade to this machine can also be done by SD card. With an ergonomic compact design, 2.8" Graphic LCD display and user-friendly interface for users, the XCount+ provides a reasonable security standards against the latest counterfeiting attempts through multi-detection technology, while still maintaining a low false alarm level and an excellent acceptance rate of bill recognition using IR-array sensor. XCount+ is adopted with software to read New Gen $100 bill.